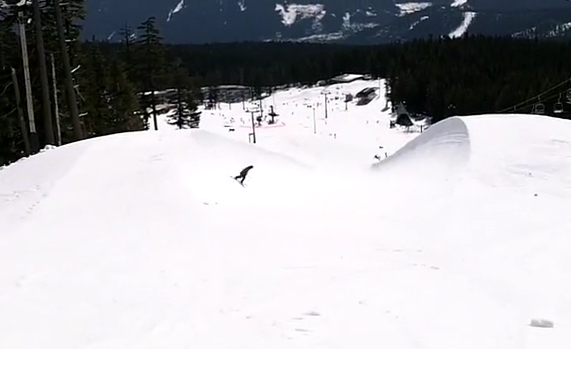 I would say it’s full-on spring here in Oregon and the park riding is prime but that’s not exactly true. This edit is from the 18th, a 45° day riding park at Meadows. It was a beautiful day and really fun riding with Al Brede and Joel Parker. The only bummer about the day is that I didn’t feel “on it” enough to take out the camera much. Since the 18th, Hood has been under attack by a cold snap and snow. Meadows report 36″ of good quality snow this week while I melted away in my office chair unable to get up there. Warm spring like weather is returning for this weekend and I’ll be on a splitboard mission in search of the pow I missed this week. Check back for a better park edit soon as I get my wits back on the booters and boxes.